Earlier this week, I happened to be reading my email around 12:15 p.m. when one of our teachers sent a message to the staff asking for someone to take her outdoor lunch duty as she was not feeling well. I read the email, checked my calendar to see if I was free, and given that the majority of our teachers would not have a chance to read this in time to help out, I replied that I would do it. My day, up to this point, consisted of back-to-back meetings so this was definitely an incentive to get outside, enjoy the sunshine and talk with the students. I was surprised by the reception. Since I was “officially” on duty, and not just wandering around the field as I do a couple of times a week (especially when the weather has been as great as it has been this week! ), I felt it was important that I put on one of our orange vests – or as I call it, my “orange cape”. Our teachers wear these at recess so that they are easily identifiable to the students. I want to point out, it clashed with my red tie and candy cane striped socks (gift from the in-laws), but I did it anyway. I now have a better understanding of the fashion faux pas each of our teachers are required to make while on duty. Two girls ran over to me giggling and asked, “Mr. Logan, can you keep a secret?” I told them no. Of course this didn’t matter as one of them told me that she really likes one of our grade 8 boys and is lucky enough to have him as her lunch time supervisor. I had no response, except to let her parents know so that we could share a laugh. Another student looked at me from the monkey bar platform, and told me, in a tiny voice, that she couldn’t climb across all the bars but she was going to try. By the end of recess she had managed to hang from the bar and swing herself back to the platform. She was quite proud and told me so as we were walking up the hill to go back into the school. I watched a girl in grade 3 spend her entire recess swinging across the bars, the rings and everywhere else she could find so that she was not touching the ground. This was the same student who took a tumble last week, which produced a goose egg on her forehead that she would sport in a wedding party on the weekend. The goose egg is almost gone, the wedding went well, and this little girl was not afraid to get “back up on the horse” after her misadventure. A lesson adults would do well to remember. I also observed a boy who ended up with some sand in his eye as well as a grade 2 girl who showed me the scab on her hands at least four times. 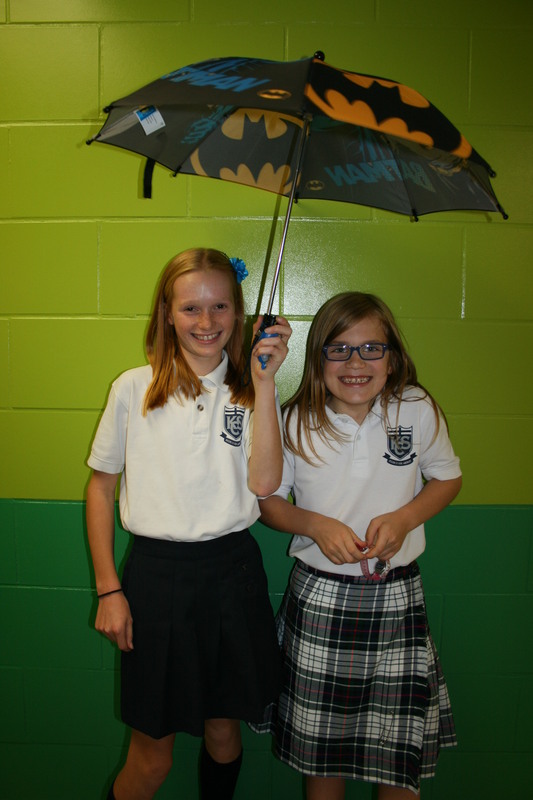 I found a Batman umbrella owned by a grade 2 boy and decided we could get a great photo when we returned inside. The photo that accompanies this blog should be captioned, Batman and Robyns. You can probably guess why. I look forward to dawning the “orange cape” again at a future recess. It sort of made me feel like Superman. This entry was posted in Memories by Derek Logan. Bookmark the permalink.